We have experience of overhauling and repairing most makes and types of geared-motors, such as SEW, Pujol, Bonfiglioli, Renold, Rossi, David Brown, Fenner, Bauer, Nord, Rehfuss, STM. 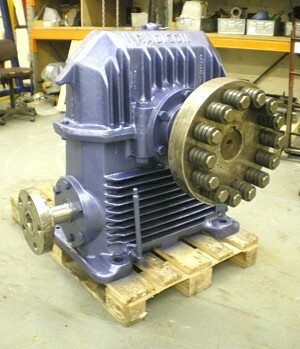 Geared units are completely stripped, cleaned and overhauled with all new seals and bearings. Motors are overhauled or rewound as required, reassembled, and tested in accordance with our ISO.9001:2008 based Quality Management System. We can remove, dismantle, report, overhaul, refit to your instructions. An in-house "free-of-charge", or on-site initial inspection and report is issued with estimated price and delivery. We will give a fair appraisal and discuss with the client the best line of action. Sometimes it is less costly to buy new. We can help with the selection and sourcing of new gearedmotors for replacement or new applications. Our vehicles collect and deliver. All customers' geared-motors are tracked and treated with care from the moment they are received to the moment they are delivered.